This one has been a popular one and I'm excited that this is the next block we are doing! Check out block inspiration on Pinterest! I made this one using four colors -- the best thing to do is to lay out the block in its entirety before you do any sewing! This will help you to make the units with the right colors in each section. I found it helpful to think about the block aligned on a clock -- ie 3 is the red, 6 is the green, 9 is the orange, and 12 is the blue as shown in the diagram above. 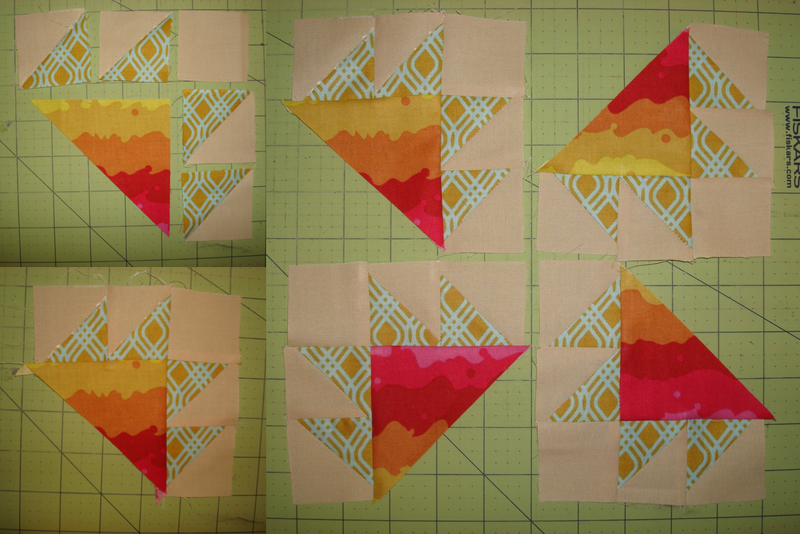 Lay out your block -- try to place your colors so that there is contrast between each neighboring color. Sew your center unit together using four small triangles -- one of each color -- being careful to keep the correct colors in the correct orientation. Sew each of your remaining small colored triangles to a small background triangle. If you place each triangle with the 90 degree corner pointing up, the small colored triangle should be on the RIGHT. Add each of your small triangle units from the previous step to the correct large colored triangle. 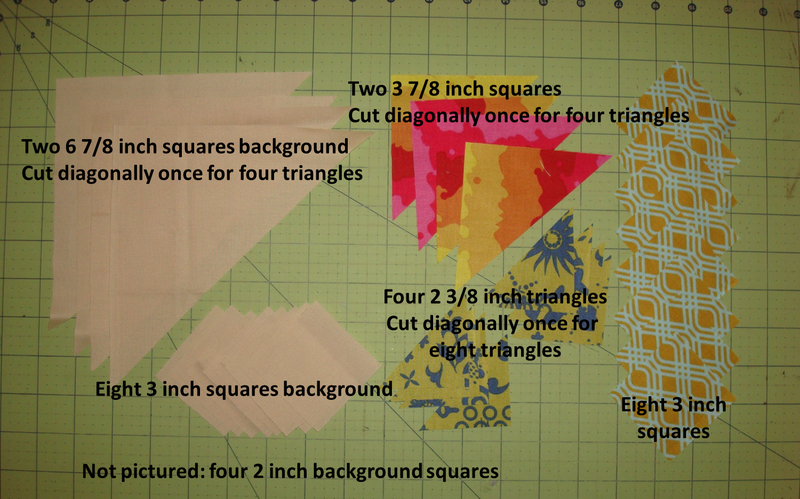 Sew each of your remaining large colored triangles to one of the large background triangles. Lay out your block and double check that all of your units have been put together correctly! Sew together into rows and sew rows together for finished block! Here are my nine finished blocks! They are looking lovely together! Please post pictures of your finished card trick blocks AND a picture of all of your finished blocks thus far in the Flickr group! 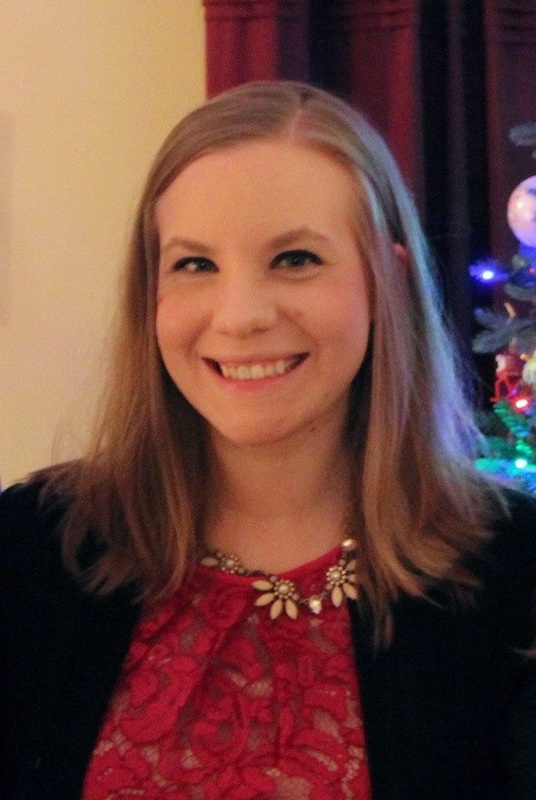 Today is my 26th birthday! To celebrate I am going to sew all day. Duh. If you didn't see the post on the HB&D Designs Facebook page already, we have patterns on sale to celebrate in our Etsy shop! If you follow me on Instagram, you've seen that my husband and I have a new addition -- a Lionhead rabbit named Clara! She's getting used to her new home and we are loving seeing her hop around and explore our apartment! Now my blog name is legit! The sound of the sewing machine doesn't scare her so she makes a perfect sewing companion. Happy Sunday to you and happy birthday to me! These still need to go in the mail, but they are done! The four on the left are the ones for my swap mates and the one on the right is for me! I used a modified version of a Wild Goose Chase pattern I found in the Quilter's Cache and spent a lot of time making flying geese these last few weeks! I think my favorite one is the Halloween one in the lower left corner, other than my own of course! Now I am all out of my stash of mint green fabric (which wasn't very much to begin with!) so I'm going to have to go shopping! Good thing my birthday is next Sunday! This round's winner is Kansas Troubles! This block is a very traditional block and I made one when I was making the Civil War Quilt for my husband with the Barbara Brackman QAL a few years back. This one is only 8 inches finished! Pinterest has some inspiration for this block, but not quite as much "modern" versions as you might expect. Most versions of this block that I've seen previous are a two color block like the one I made before. I decided to spice things up a bit and make my pattern block in three colors (as the diagram above) for a more modern twist. Draw diagonal lines on your 3 inch background squares. 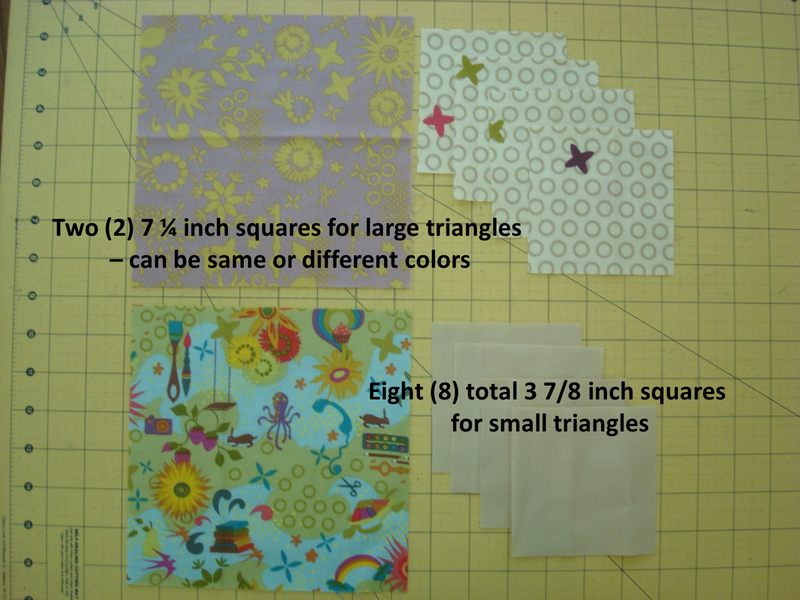 Pair each with one focal 3 inch square and sew 1/4 inch from the drawn line, cut apart, press, and trim squares to 2 inches. Yield: sixteen (16) HSTs. Lay out each of your quadrants as shown below using the medium triangles. 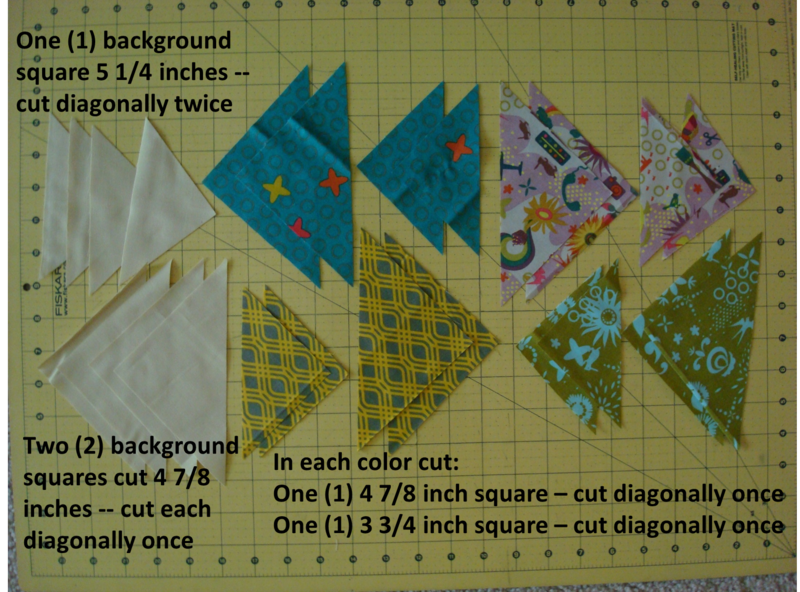 Sew HSTs in pairs, then sew one pair of HSTs to your medium triangle and the other pair to your 2 inch background square. Sew these two units together as shown below. Repeat for all four quadrants. To the sides of each of your quadrants, add your small triangles as shown below. 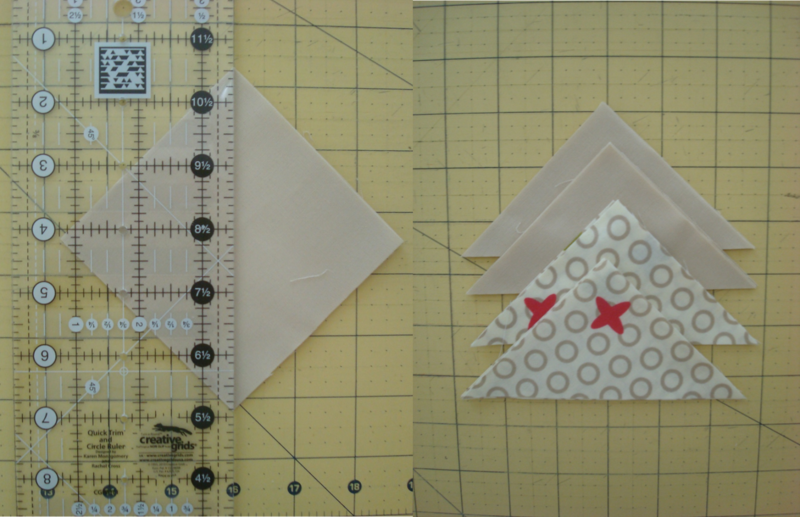 Sew one large triangle to each of your units. Lay out as shown below. 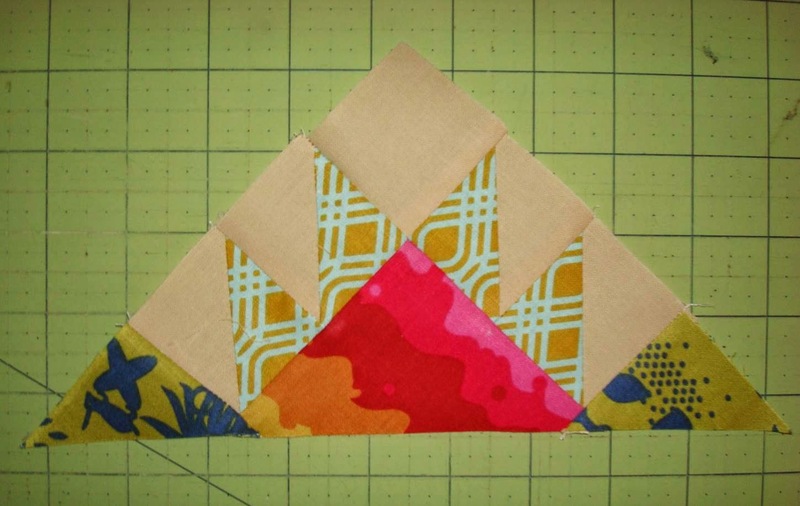 Sew together quadrants to finish your block! Share your finished blocks in the Flickr group! Today I'm working on finishing up the last two bee blocks for this month in the Sew Pieceful Bee. The grey, peach, lilac and mint block is my block for me. The other two are are for my swap-mates. I have been making piles of fast flying geese lately!! Isn't the Halloween block fun?? The two blocks I need to make today are 1) aqua/lime green/yellow and 2) night sky colors with black. I am about 99% sure that is the only piece of fabric I have right now with ANY lime green in it. I guess that I've finally run out of the scraps from my Twist of Lime quilt! I'm starting on the night sky block first. Four down, twenty eight more geese to go today. I'm getting this goal submitted juuuuust under the wire! I started working on a scrappy quilt top using blue/grey/aqua batiks with a white/cream/grey scrappy background before we moved and this month I want to get the rest of the paper pieced triangle units finished and then get the top put together. Right now, I have all of the four-patch units done and I have all of the square in a square units completed as well. BUT I know that I still have at least 40 of the triangle units to make and I need to pull a few more fabrics in blues from my scrap bins to make sure that I don't run out! I stopped by the local quilt shop yesterday to get a half yard of the off white dotty batik in the picture and I am definitely going to have to hit up some other semi-local quilt shops to get a wider variety of background fabrics so that it looks scrappy. I was hoping to get quarter yards of a half dozen or so different fabrics, but there was not much to choose from at that shop. Linking up my goal to A Lovely Year of Finishes! Today is the last day for June to link up goals, so sort through that WIP pile and get one submitted! This month for the Stash Bee in Hive 3 our Queen Bee is Daisy from Ants To Sugar! 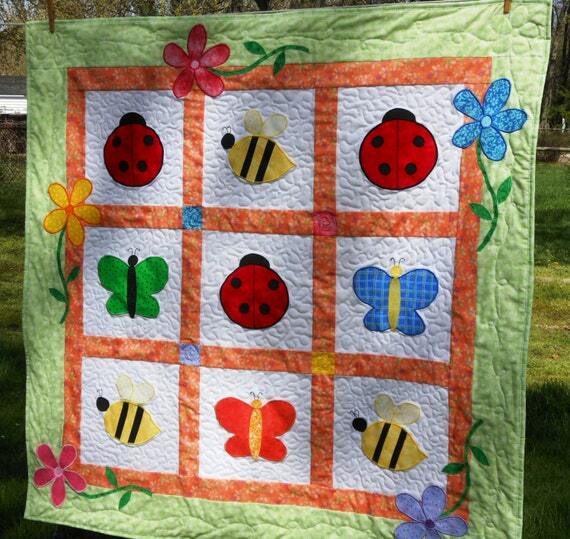 She requested blocks with butterflies or economy blocks with butterfly fabrics and low volume fabrics. 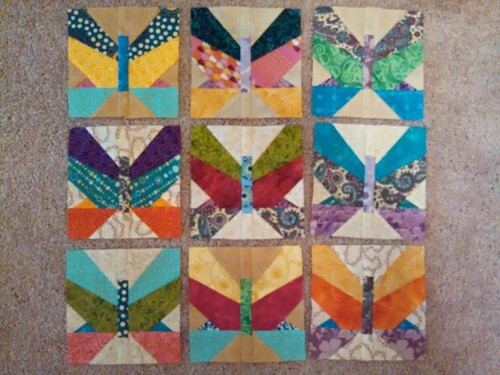 I found a great free pattern on Craftsy for a 6" finished paper pieced butterfly and went to work on nine butterflies from my scrap stash! I love how bright and vivid they are! 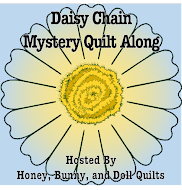 I decided not to sew them together, so that Daisy can put them together however she wishes! It's the beginning of the month, so that means it is time for us to indulge in all of our BOMs! Here's my version of Susannah from the Wishes QAL at Fat Quarter shop! 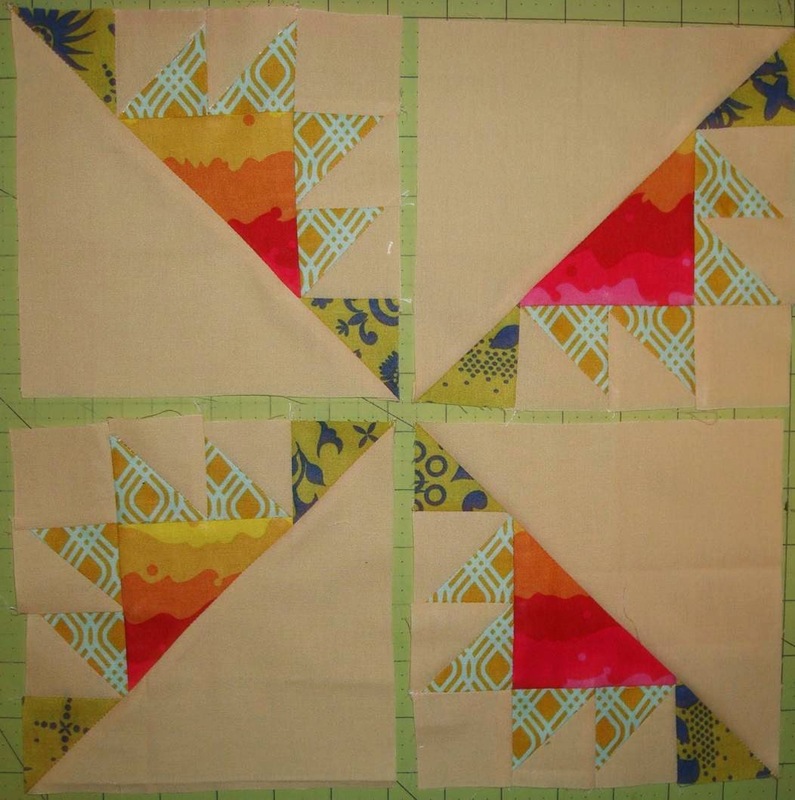 I love these big blocks with easy piecing! If you haven't joined in yet, all of the blocks are still up! Don't forget to vote for block #8 and check out the tutorial for block #7 --Dutchman's Puzzle! PS. Like Honey, Bunny, and Doll's Facebook page -- there might just be a SALE coming up this weekend! This time around we are making Dutchman's Puzzle blocks! This is a SUPER versatile block that you can color in a HUGE variety of ways. Check it out on Pinterest and be prepared to add a Dutchman's Puzzle quilt to your bucket list! 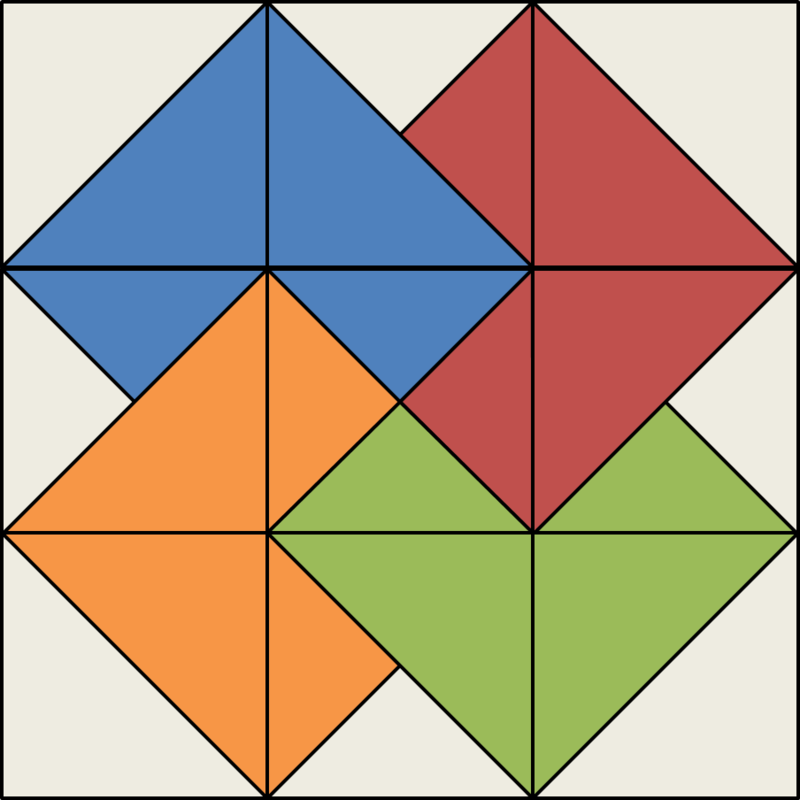 The block shown above is the second simplest version of the block (the simplest being a two color block). For my block, I chose to do a four color block (background plus three focus fabrics). Eight (8) total 3 7/8 inch squares -- I cut four (4) background squares and four (4) focus fabric squares. 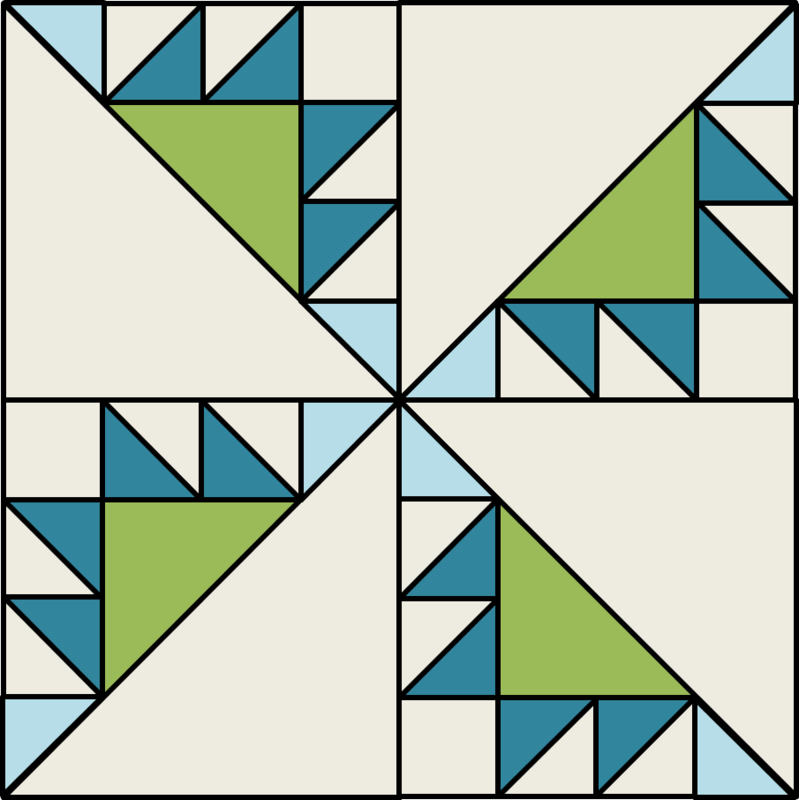 Note about small triangles -- you will need one (1) 3 7/8 inch square for every two (2) small triangles of any particular color. If you only want a center pinwheel you'll need two colored squares and 6 background squares. 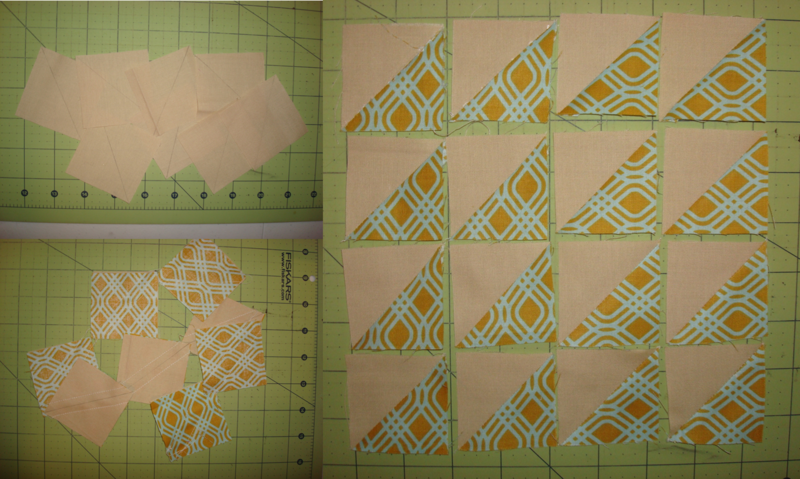 Cut each one of your 3 7/8 inch squares in half diagonally once, yielding sixteen (16) total small triangles. Cut each one of your 7 1/4 inch squares in half diagonally twice, yielding eight (8) total large triangles. This arrangement in each quadrant yields a block with an inner pinwheel and corners in my third fabric color. 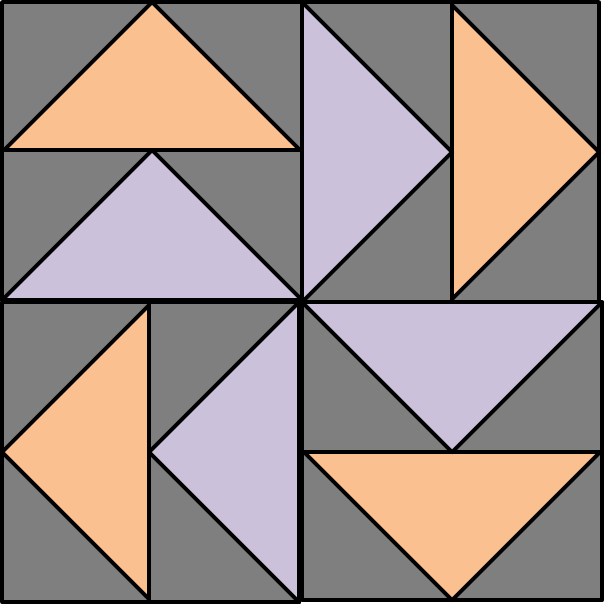 Sew small triangles to large triangles to yield eight (8) flying geese units. Don't forget to trim your dog ears! 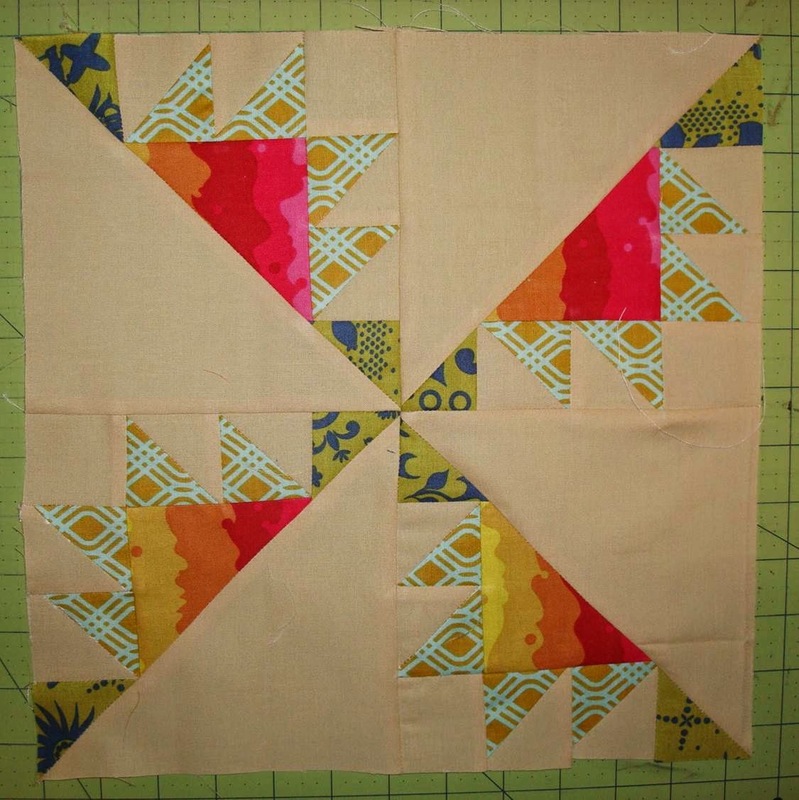 Lay out your block as desired and sew pairs of flying geese together. Finally, sew your four quadrants together for your final block!